This past Sunday afternoon I was getting ready to walk down to the beach, only a few blocks from my home, when I heard a very loud clap of thunder that shook the Earth like a mini sonic boom. Thunder is a rare event in Santa Monica, California so I immediately turned around and went back inside not wanting to chance getting caught in a possible shower. I say shower because we rarely get driving rain here in Southern California, even though current drought conditions would gladly welcome it. Consider my surprise when a few hours later I get word that 13 people were struck by lightning near the Venice Beach Pier, only a few miles away, with one reported fatality. It just so happens that a friend was there when it happened and he gave me the full story. Larry was playing volleyball near the Venice Beach Pier with a group of “very tall dudes,'” as he describes it, when around 2:30 PM, “out of nowhere” all of the players “felt a crackle of electricity” over them and were instantaneously knocked to the ground. One player was struck by lightning on his forehead, another felt it go over his hairline, while Larry (who claims his shortness saved him) only felt an electrical tingling wash over his skin. Others were not as lucky as the bolt of lightning hit both ocean and beach. 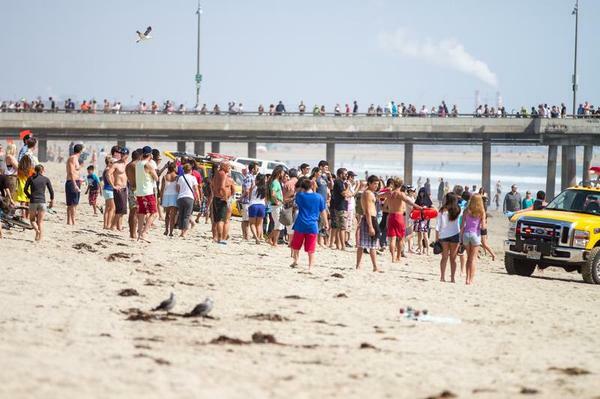 The ocean water became a conductor of electricity, hitting surfers and swimmers, causing one high school boy to drown. Those on the beach felt it pulse through their bodies. There was no warning and no time to get off the beach. The experts claim this freakish weather event is extremely rare and those who have lived here for decades can’t remember it ever having happened to so many beach-goers. What could have caused it? What the media didn’t report was that “cloud to ground lightning” was also felt that day at the end of a runaway at Los Angeles Airport, and that such an event has happened at other U.S. airports where they were either hit by freak bolts of lightning or a freakish tornado that came out of nowhere (i.e., Boston, Denver Airports). I’m not looking to start a conspiracy theory post here, but I do know something about high radio frequency induced storms and it appears it is being done more frequently these days to control the weather. I know I will get lots of comments relating this phenomenon to HAARP, the government’s “High Frequency Active Auroral Research” project, but we have no way of knowing if frequency inducing waves have or have not been used to modify California’s weather. Maybe we’ll never know. Taking into account Kaku and Cohen’s statements, the more important fact is that through science man has found a way to tinker with Mother Nature. And ultimately, it often backfires. Back in the late 70s, I had a great (and now well-known) Journalism professor at NYU, William E. Burrows. The first day of class he asked us what was the one thing in the world that affected everything in news. Not one person in the lecture hall got the answer right which is “weather.” It can cause famine, lead to and/or stop wars, bring about death and destruction, yet also bring about new life. Pretty powerful stuff. https://i2.wp.com/www.trinfinity8.com/wp-content/uploads/2014/07/600x399184.jpg?fit=600%2C399&ssl=1 399 600 Kathy J. Forti https://www.trinfinity8.com/wp-content/uploads/2014/05/FINAL_trinfinityLOGOrevised-for-web-logo-300x174.png Kathy J. Forti2014-07-29 18:59:052019-01-08 00:11:11Freak Lightning or Weather Modification?